Revolutions are being created every day by people like you and me. Everyday heroes creating social good. But who are they and what can we learn from them? 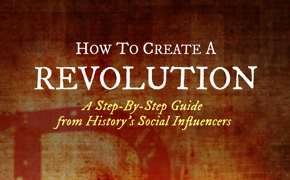 I am very proud to introduce my new book, “How to Create a Revolution: A Step-by-Step Guide from History’s Social Influencers“. In each chapter, I tell the story of an social influencer from throughout history, as well as history an everyday hero doing great work today. 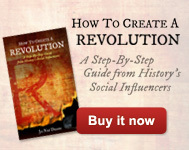 I also walk through the book and give step-by-step instructions on how to create your own revolution. Get Your Revolutionary Toolkit and Donate to Charity at the Same Time! 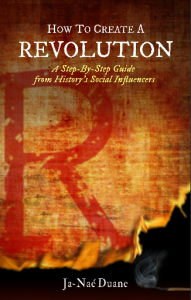 All the proceeds to the book, How to Create a Revolution: A Step-by-Step Guide to History’s Social Influencers are going to support five great charities. Each of these charities are creating their own revolutions and changing the world. Ordering this book will not only help you create a revolution but it will support these worthy causes. We will be highlighting each of these charities and raising awareness during Our Revolution Week starting today! Ready to Spark Your Own Revolution and Donate? DIGITAL DOWNLOAD: digital download of book…with bonus exclusive content and a virtual high-five and shoutout from all of us. Are you a revolutionary change agent? With “The Agent” package you get a copy of the book, “How to Create a Revolution: A Step-By-Step Guide from History’s Social Influencers”, our e-books “30-Day Action Plan”, “Content Strategy” and “Social Media Revolution 101”. If purchased separately it would cost $65, if you buy now, it is $49.95. Think you are a rebel? Ready to be radical and change the world? With “The Rebel” package, you receive everything in the Agent package PLUS our e-books “Revolutionary Communications”, “Train Your Willpower” and Revolutionary Social Journalism (How to Socially Cover an Event) PLUS a 30 min call with author and advisor Ja-Nae Duane and two weeks of complimentary email consultation with her to help you create your own revolution. If purchased separately it would cost $125, if you buy now, it is $79.95. Ready to lead the charge? Every revolution needs a general and that should be you. With “The General Package”, you receive everything in the Agent and Rebel packages PLUS two (2) 30 min calls with author and advisor Ja-Nae Duane and a month of complimentary email consultation with her to help you create your own revolution. If purchased separately it would cost $250 if you buy now, it is $99.95. After you have donated, please tell everyone you did it, AND SPREAD THIS LINK FAR AND WIDE.